Film Review: “Storm/Twister II” – I Love Disaster Movies! A film so generically bad that although its initial title was called Twister II, it appears that even that couldn’t stick and so in UK shores the film is simply known as Storm. Not hurricane. Storm. The tag line is “You Will Get Wet”. The problem with all the above? None of it really happens properly and as a result the film flops from start to end. Evil government tries to harness tornadoes for weapon purposes. Bad times all round. Tornadoes, a tidal wave, some dodgy flying, suicidal army folk, Martin Sheen barking orders whilst drinking tea and Martin Sheen scared at the prospect of going outside to shoot a scene. The problem with Storm is it markets itself misguidedly from the start. It tries to say its a disaster movie but actually the vast majority of the film takes place in a control room and a plane. It’s more a sneak/spy film that doesn’t even have the guts to follow through on that premise either. Martin Sheen never leaves the same two rooms – I presume because there’s no budget for him to walk and talk. Luke Perry looks amused at the whole production and whilst he makes a decent stab of lead man, he’s forced through an idiotic script to act like an idiot. Rene Estevez’s character is utterly vile from start to finish. Why place her in peril when we actually wish she didn’t survive? The peril itself comes with ten minutes to go in the film. Suddenly the cast expands in the final third of the film to include character we’d not seen until then so you know they are being set up for the effects. It’s just shoddy from start to end. The sets are wobbly – especially the high-security section which is actually port-a-cabins in a parking lot. The CGI is not fantastic although its far from the most offensive I’ve seen. Best of all is the tidal wave which comes at you in a single line and then when it hits our duo they get about a bucket of water thrown over them. Too see exactly how pacing, character development and bad marketing can ruin a film. How can we get worried about a Tornado or Tidal Wave if we just see one appear suddenly without warning? Why are important characters dying off screen? Drinking game is for every time Perry says something smug and if you’re feeling brave each time Sheen makes a judgement call that will kill cast members. I wouldn’t work for him if my life depended on it! I’d have a better survival rate. Perhaps the missing links for some of my moans are down to the fact that the DVD release here is 90 minutes long whilst imdb states its 104 minutes long. Are we missing more filler or some actual vital sections of build up? Who knows! Despite being in only two scenes its great to see Glenn Shadix in the film, stealing the camera and then promptly disappearing again – like he accidentally walked onto set and they just left it in the film. Helicopter explosion is the only way to go in this film. Each time someone hangs up on another character on the phone. These characters have no phone etiquette to speak of at all! Martin Sheen’s penchant for drinking tea whilst killing… in a china cup. 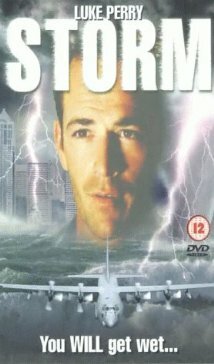 Another note to make is Luke Perry’s penchant for movies with Storm’s involved. He starred in this, came back with The Final Storm (actually not bad at all) and also stars in The Storm which looks like another low budget TV movie I’ve yet to pick up. Rain issues Luke? Terrible drivel that’s not quite terrible enough to be good again and whilst no one is offending my eyes or ears on screen, it’s the script and lack of direction that brings the film crashing down. There’s no storm. No tornado attack. It’s just a bit windy.